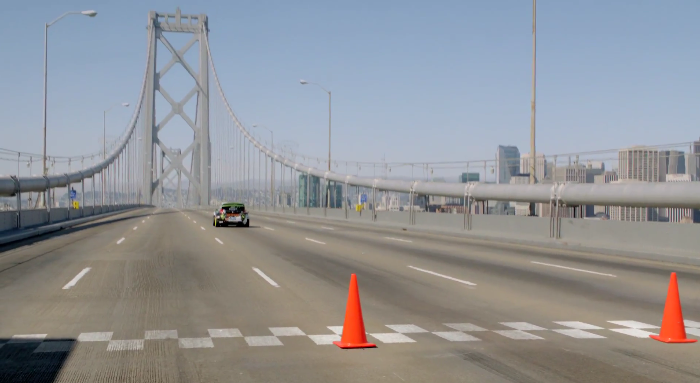 Watch Ken Block Tear Up San Francisco. For readers who don’t reside in the Bay Area, or who may not be familiar with San Francisco’s topographic features, this video shows you what regular driver have ALWAYS wanted to do in our fair city. There isn’t a man, woman, or child who hasn’t dreams of doing what Ken Block and his drift car do so well in one of his latest stunt videos. From shutting down the Bay Bridge, to drifting on a moving barge, Block reminds us why he’s the best in the world at what he does. Check the method below. And for any local drivers who have seen the tire marks in the middle of the top deck of the Bay Bridge, and wondered what maniac left those there… it was Ken.